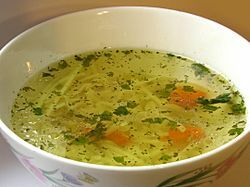 Broth is sometimes defined as the liquid part of soup. It can be made by boiling meat in water and taking out the fat. It is sometimes used as an ingredient in recipes to make food taste better. In Britain, a broth is a soup in which there are solid pieces of meat or fish, with some vegetables. It is usually made with a stock or plain water as its base, with meat or fish added while being brought to a boil, and vegetables added later. Broth is often made more substantial by adding rice, barley or pulses. Broth is distinct from stock, which is a thin liquid made by simmering raw ingredients until all the taste has been retrieved from them, then sieving the resulting liquid. In the United States terms, broths are made from portions of meat, whereas stocks are made from vegetable scraps and bones. Broth Facts for Kids. Kiddle Encyclopedia.